The White House Plan That Could Get Millions Of Immigrants To Vote : It's All Politics The Obama administration is kicking off a campaign to encourage legal immigrants in the country to become citizens, which could potentially swell voter rolls by millions before Election Day. 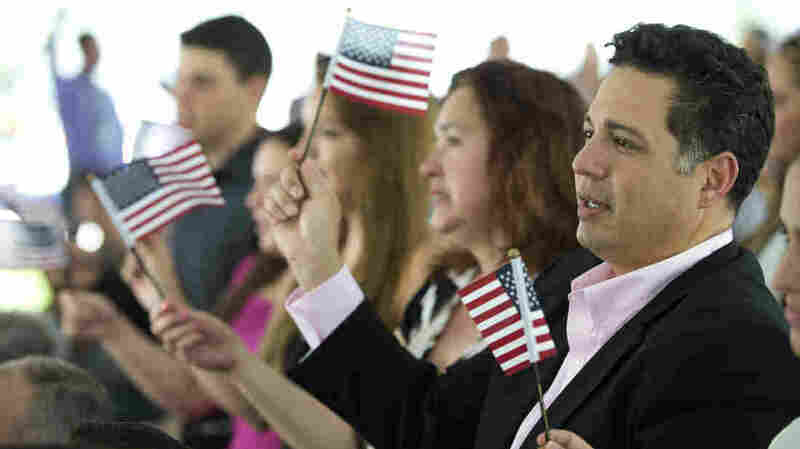 New citizens wave American flags during a U.S. Citizenship and Immigration Services naturalization ceremony in Miami in July. It's a multifaceted effort that could potentially add millions of new people to the voter rolls before the 2016 presidential election. The outreach includes online citizenship practice tests, the ability to pay fees with a credit card, and public service announcements on Univision. While the White House does not portray the citizenship push as a partisan one, Karthick Ramakrishnan, a public policy professor at the University of California, Riverside who focuses on civic engagement and immigration, said efforts to increase the ranks of U.S. citizens are often seen through a political lens. "Anytime there's a major push for naturalization by the White House ... especially when a Democratic administration does it, there's always the allegation that this is an attempt to try to get more Democratic voters," Ramakrishnan said. He heard the same insinuations during the debate about immigration reform in Congress, he points out. "When people were talking about a pathway to citizenship," Ramakrishnan recalled, "some Republicans were saying ... if they became citizens, they're going to be Democrats." Of the 8.8 million legal immigrants eligible to become citizens, about 5.4 million are Latino (and, overwhelmingly, they're from Mexico). "Many of them lean Democrat just as most Hispanics do," said Mark Hugo-Lopez, director of Hispanic research at the Pew Research Center. And, interestingly, Lopez adds, his research suggests naturalized Latinos vote at higher rates than U.S.-born Latinos. Of the 3.4 million immigrants who are not Latino, many come from Asia. A strong majority of both Latinos and Asian-Americans voted for President Obama in 2008 and 2012. "For Latinos, and increasingly for Asian-Americans, naturalized voters tend to favor the Democratic Party," Ramakrishnan said, "at least when it comes to presidential elections, by a 2-to-1 margin." But Manuel Pastor, director of the University of Southern California's Center for the Study of Immigrant Integration, points out that new citizens are leaning Democratic because of the political climate at this particular moment in history. "A lot of the people who became legalized ... through the program President Reagan put in place, felt a real sense of gratitude toward Ronald Reagan and the Republican Party," Pastor explained, "and so when many of those people naturalized, they leaned toward the Republican camp." The White House citizenship effort is part of the president's Task Force on New Americans, which was created through his 2014 executive actions on immigration. But this particular outreach comes at a time when immigration has also again become a heated campaign topic in the GOP primary. "Because the debate over immigration has gotten so polarized, and partisan ... there's a widening, deepening sense that immigrants should naturalize and should use the power of the vote to steer policy," Pastor said. That seems to be what's happening. Tara Raghuveer, the policy and advocacy director at the National Partnership for New Americans, one of the community partners working with the White House to promote citizenship, said her organization is encouraging people to become citizens "specifically in response to all the hate we've been seeing on a national stage about immigration recently." She added, "We're telling people to naturalize now; we've had enough of this anti-immigrant rhetoric, and it's time for us to step up." But adding millions to the voter rolls from this group in short order would be overstating it, says Ramakrishnan. "The [United States Citizenship and Immigration Services] is kind of like the DMV of the federal government, in many ways, even more complicated," said Ramakrishnan, a naturalized U.S. citizen himself. He says it's likely that only a fraction of the 8.8 million immigrants will actually become citizens, register to vote and then follow through on Election Day, because it's a long, expensive process. "The political payoffs are not as dramatic as some might think," he said. "Also, many of these states, where these big numbers will come from, will be states like California, New York, Texas. And, at least for the presidential contest, these are not competitive states." Of course, Texas, which is already a "majority minority state," has been on Democrats' radar to flip — though that is unlikely anytime soon after failed statewide attempts. Not a single statewide elected representative in Texas is a Democrat. Pastor says that even if a rapid change in citizenship status doesn't affect the next election, it could still affect long-term policy, because immigrants are seeing citizenship as their best protection in a heated political atmosphere. He points out that in the mid-1990s, naturalization rates increased substantially in California after Proposition 187, a ballot measure denying public services to people who came into the country illegally. And, he adds, that same hunger to become a citizen could emerge again this year.